Try for free our cloud computing server! If you register in the site, you’ll get 10 credits for free. 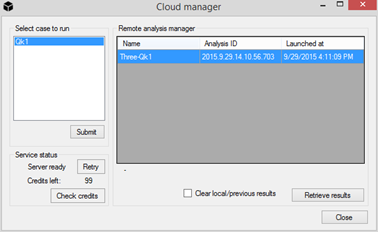 The Login to cloud command allows to run analyses on cloud by connecting to the NextFEM server using the user’s credential. To log into the cloud insert your Username and your Password. Once connected to the cloud, it is possible to launch analyses by selecting them from the Select case to run list, and then click on the Submit button. Once the analysis has been submitted, it will be completed in the cloud. When completed, it is possible to get the result at any time clicking on the Retrieve results button.